A3 Size 9.7 x 13.5 in. (246 x 342 mm) 11.7 x 16.5 in. 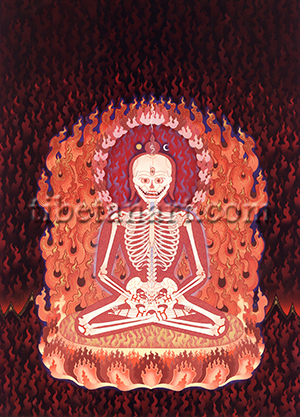 I made this Blazing Skeleton painting in 1985 as a cover for the paperback edition of “Death and Dying – The Tibetan Tradition” by Glenn H. Mullin, which was published by Arcana Paperbacks in 1986. Having received a printout copy of the text I designed this cover image on the chapter dealing with ‘The Yoga of Consciousness Transference’ or phowa (Tib. ‘pho ba; Skt. samkranti), which here is associated with Maitreya Buddha and his Pure Land known as Tushita. This practice involves visualizing one’s body as being transparent, with Maitreya Buddha appearing above the crown of one’s head. The median or central channel that runs though one’s body is visualized as arising in front of the spine from a narrow point three finger-widths below the navel. Like a long horn this channel broadens as it ascends towards the open ‘aperture of Brahma’ at the crown of the head, with the Tibetan syllable HAM arising above its mouth and making contact with the lower aperture of Maitreya’s central channel. The practitioner’s mind, visualized as the most-subtle essence or ‘indestructible drop’ at the heart centre, white above and red below, is awakened by the radiant light rays that descend from Maitreya’s central channel and is magnetically drawn upwards. While uttering the syllable HIK this subtle drop shoots up from the heart towards the throat centre, then falls back, and with repetition shoots up to the crown. The sign of accomplishment in this practice is when a small blister aperture or fluid drop appears on the crown of the head, into which a narrow stalk of kusha grass is traditionally inserted. It is through this ‘tenth bodily aperture’ that the consciousness is believed to exit at the time of death, leading to rebirth in a Pure Land such as Maitreya’s heavenly realm of Tushita, or Amitabha’s western paradise of Sukhavati. There are many phowa practice traditions, which essentially stem from the 'Six Yogas or Doctrines of Naropa and of Niguma' or from the Vajrayogini Tantra, and these teachings have to be be transmitted by authentic lineage holders and not attempted individually, as this can easily shorten one's lifespan. The outer or fleshy form of this skeletal figure manifests in the aspect of red Amitabha Buddha, who sits in vajra-posture upon the disc of a fiery lotus with his right palm resting upon his left palm in the dhyana-mudra of meditative equipoise, or meditation upon emptiness. His red body is permeated with the network of fine energy channels (Skt. nadi) that stem from the heart chakra or 'channel-wheel', with an ethereal blue aura surrounding his body and head, with its long ear lobes and ushnisha or enlightened crown protuberance. The skeleton sits upon a moon-disc and lotus fashioned from red and orange flames, as are his halo and fiery aura. His blue central channel ascends from a point three finger-widths below his navel, and broadens as it rises in front of his spine and behind his breastbone to re-appear at his throat. The Tibetan syllable HAM appears above his crown aperture, with orbs of the golden sun and white moon on each side of his ushnisha. An ethereal red and white flame ascends above the jewel-top of his crown protuberance, representing the consciousness ascending through the ‘tenth door’ or ‘aperture of Brahma’ towards a most auspicious rebirth in one of the Pure Lands of the Buddhas. The skeleton’s three eyes represent the body’s three main psychic energy channels: the median or central channel (Skt. avadhuti), the red solar channel (Skt. rasana), and the white lunar channel (Skt. lalana).